Type key word below in lower case letters. New! 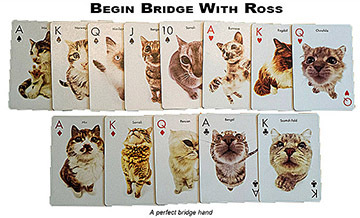 Begin bridge with Ross. Ross F. Collins photography: New work, legacy images, foundations. Fear fake news? Then get Ross's poster! (Free pdf download). Or buy a Fear Fake News mug, t-shirt or other novelty and contribute to the Dorothy Collins endowment for student scholarships. New! Ross's Durable Dozen. 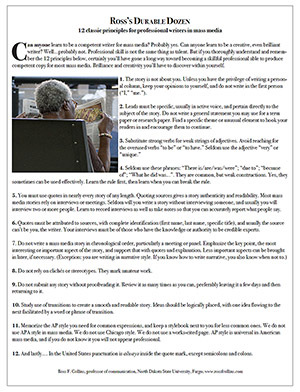 Twelve classic principles for professional writers in mass media. "The Press at the Century's Turn. Cultural icon, corporate behemoth, corrupted arbiter." Presentation for "The Coming of the Great War," symposium, National World War I Museum, Kansas City. Choosing Your Career in the Mass Media. Are you confused about the many career choices available in the mass media? Of course you are! Well, why not find some answers? Consult Ross's Choosing Your Career in Mass Media node map or poster! A troubling development of the brutal century recently passed has been the growing use of children for war. As the world wars changed societies in so many ways, they also changed expectations for children during wartime. In total war, war on an immense, world-wide scale, everyone worked. Including children of all ages. Fargo Fit! Ross's workouts for the north country exerciser. Been everywhere? Take the travel quiz! That's a Fact! Or Is it? Nine Ways to Invite the Grim Reaper. The Web Design Horror Show! Editing Across Media Content and Process for Print and Online Publication. Like it on Facebook, learn more about editing. Ross F. Collins, Ph.D., Professor, Department of Communication, North Dakota State University, Fargo, ND 58105 USA/701 231-7295.